Because it&apos;s too cold to play outside, I&apos;ve spent many hours this winter breaking up wrestling matches between my two young sons. They have lots of energy to burn, but can&apos;t go outside to do it. We&apos;re always looking for indoor places where my kids can get active, and I can save my sanity.This week we decided to check out the new play area at Plainfield Christian Church. 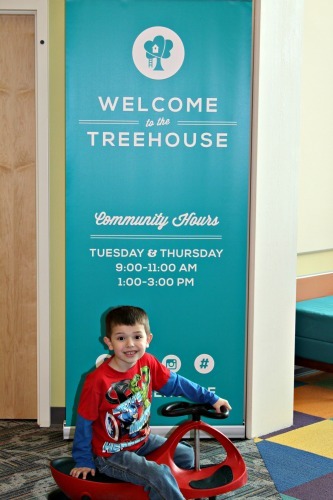 The Treehouse is designed for little ones ages 2 to 12 to climb, run, jump, and explore. 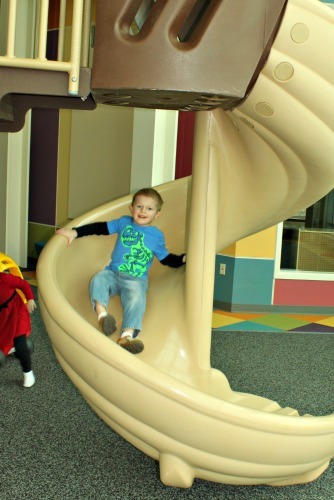 This indoor playspace features a large climbing structure with lots of slides, several riding toys, and some other small play stations that are perfect for little ones. My boys are 5 and 4, and they had a great time at The Treehouse. They loved all the different things to play with, and that they had plenty of room to chase each other without mom getting upset! I loved the comfy seating that gave me a good view of my kids, the clean, accessible bathrooms and the friendly staff. The decor is also gorgeous, with lots of natural light and murals on the walls. 1. The play area is designed for kids ages 2 to 12. Children younger than 2 might be too small for many of the activities, and children over 12 will probably be bored. 2. The lower two levels of the giant play structure are perfect for kids ages 2-5. The top structure is best suited for children over 5. 3. Shoes must be worn at all times. 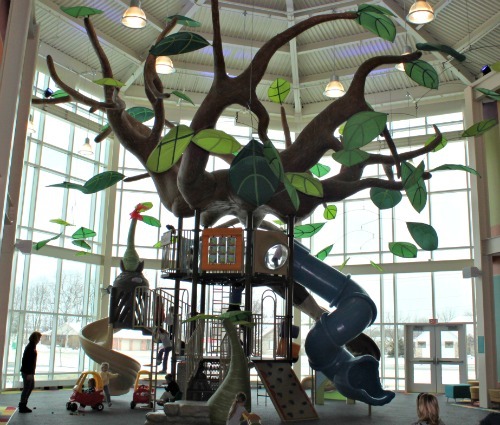 Although this is an indoor play space, it&apos;s the same type of equipment you&apos;ll find outside. It&apos;s much safer for little toes if you keep shoes on! 4. No food or drink are allowed in the play structure area. This is to keep things clean and keep kids safe. 5. The Treehouse is FREE, but it is open to the public only for limited hours during the week. You can bring your little ones to play on Tuesdays and Thursdays between 9 and 11 a.m. and 1 and 3 p.m. The Treehouse is NOT open on days when local schools are closed, like snow days or holidays. For more information, check out the Plainfield Christian Church website. Hendricks County families still have a few more weeks before playing outside is a possibility, so we&apos;re lucky to have places like The Treehouse for those days when cabin fever strikes. My boys loved the experience...and I loved the great naps they took when we got home! I think we&apos;ll be back a few more times before spring arrives.